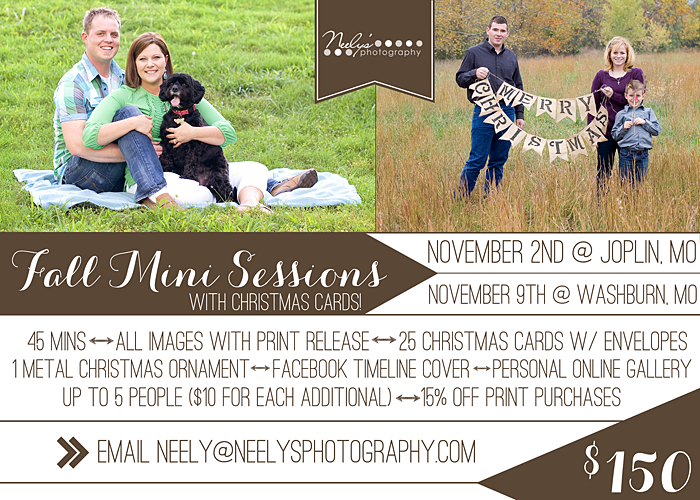 Neely's Photography: Fall Mini Sessions! Fall Mini Sessions! (And special something for past clients!) It's hard to believe it's almost Fall! With Fall comes Fall mini sessions! (How many times can I say Fall?) I'm doing things a little bit differently this year. I am offering two locations and two dates. I am also doing a 45 minute session instead of 30. With your session you will receive a whole heap of a lot! You get ALL edited digital images on a disc, 25 custom Christmas cards (with envelopes), 1 custom metal Christmas ornament, a Facebook timeline cover, personal online gallery to view your images and share with your friends, up to 5 people ($10 for each additional), 15% off any print purchases, and a whole lot of fun!! I have a banner (that you can see below in the images) that says Merry Christmas as well as a few fun props (Santa beard and hat, reindeer nose and antlers, and some little black mustaches). We'll have a great time, BELIEVE ME. If you'd like more information or would like to reserve a spot (there are limited spots available, so don't wait too long!) 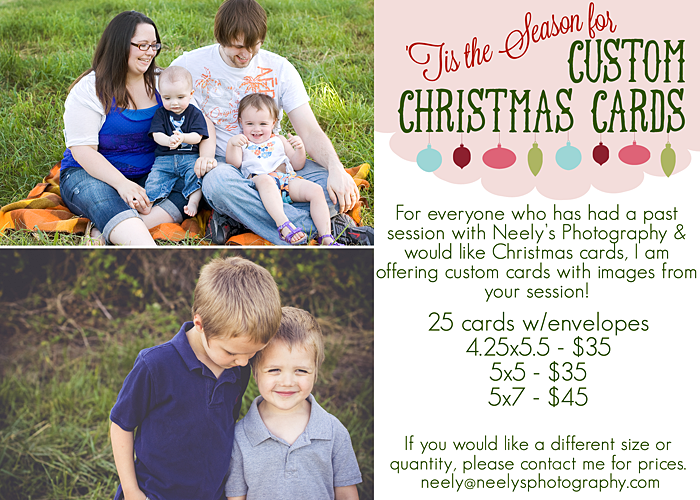 please email me at neely@neelysphotography.com Also, please share this awesome opportunity with your friends! Direct them to my Facebook page (which is http://www.facebook.com/neelysphotography) or have them contact me at the email above. DON'T CLOSE THE BROWSER YET! I'm also offering Christmas cards for past clients!! If you've had a session with me in the past and would like to send Christmas cards out this year I'm doing a special just for you!! I'd also like to stop for a second and take the time to thank you for being awesome. Thank you so much for reading my blog and also for supporting Neely's Photography! You're pretty good people. Thank you again and please never hesitate to reach out if you have any questions, concerns or just want to say hi! !